As a professional in the software industry, I am just as guilty as many of you are of committing 7 of these worst tech habits. But together, we can learn to be better! 1. Leaving equipment in plain sight: This seems too simple to be a problem, but for a lot of us, those brief forgetful moments or short breaks to the bathroom at a coffee shop can result in a frustrating situation of theft. With the abundance of devices people own, it can be hard to remember that each one is worth hundreds of dollars. Beyond that, the information we now store on our mobile smartphones, tablets, and laptops that can be hacked into and stolen is frightening. This same sentiment goes to office workers using a desktop or laptop: at the end of the day, log out or shut down completely. Leaving your computer vulnerable and unlocked can result in data hacking or deletion which could jeopardize your job and company’s security. 2. Oblivious gadget usage: It’s easy to point at the younger generations and mock them for having their cell phones glued to their palm at all times. 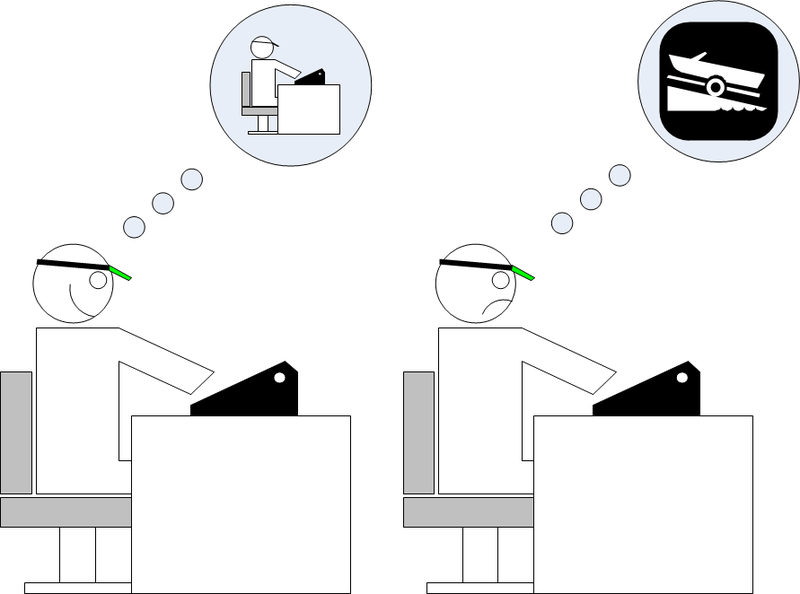 Whether it’s at work, in the classroom, the dinner table: their mobile phones are never apart from their being. Yet, hard as it is to admit, many grown adults are also guilty of constant gadget use. And as much as we try to set a good example, sometimes we do end up texting while driving, or scanning Facebook instead of watching our kid score a soccer goal, and spending time on the computer at home instead of interacting with the other people under our roof. Time to change those habits. 3. Not cleaning your equipment: Our cell phones are in our hands, our pockets, our purses, and rubbing up against the sides of our face throughout the day. But how often do we actually clean that phone..? It probably has more bacteria colonies growing on it than a public restroom’s toilet. Another forgotten piece of equipment is your computer’s keyboard, at home or at work. Take a few minutes to use canned air can to blow out the crumbs, dust, and dirt between the keys. As is described in this PCWorld article: “Dust, dirt, hair, and other debris can build up on fans and heatsinks. Components can come loose or become unseated.” Basically your computer can go to dirt if you let too much dirt accumulate on it. 4. Sitting with bad posture at the computer: This is something everyone is guilty of, no doubt about it. Sure there’s some offices that have stand-up desks, treadmill desks, or exercise ball chairs, but for the rest of us, we just need to remember to sit with the screens at eye level, our wrists and arms straight over the keyboard (not bent, which can lead to carpal tunnel), and shoulders back. You can read more here. 5. Not taking breaks: I always take a lunch break at work, but beyond that, I sometimes forget to give myself breaks from my screen. 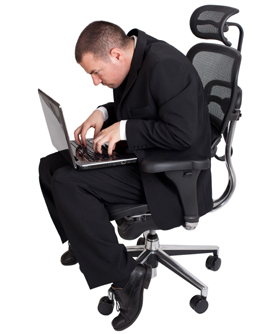 Studies have shown that constant sitting is very damaging to your health. Try walking around for a couple minutes, standing and doing stretches—anything to break up a full day of sitting on your bottom is good for you! Take short 1-2 minutestretch breaks every 20-30 minutes. After each hour of work, take a break or change tasks for at least 5-10 minutes. Always try to get away from your computer during lunch breaks. 6. Reusing passwords over and over: In today’s world, there are so many online accounts to keep track of, it can be a lot easier to use the same password across multiple accounts. But as we’ve all seen in the news more and more, data hacking and identity thievery is becoming commonplace on the Internet. Two basic solutions for this problem are, first, to keep a spreadsheet to contain the necessary (user name, password, email, website, etc.) to keep organized. You can “Password Protect” this sheet, using a master password that you will never forget for as long as you live! The second solution a lot of people use is a one-stop-shop password application like 1Password or LastPass that gives users a safe way to have a “safe” full of personal data that you don’t want laying around the house or office. Another tip from us is to regularly schedule deletions of your deleted data, temporary files, and Internet search history using Laplink’s SafeErase. It uses six government-level deletion methods to permanently erase your data so that it is unrecoverable, even if a hacker uses the most sophisticated recovery software. Your data will be gone. 7. Failing to back up data: This is another scenario where you don’t want to be caught unaware. While most of the time our computers are reliable, and our data is safe, it only takes one time to make the idea of losing everything on your PC a living nightmare. By being proactive about your backup habits, you can protect yourself against complete data loss. And with Windows 10’s release, you can also take an image of the entire PC’s contents, including the operating system, using Laplink’s DiskImage software. DiskImage makes a mirror copy of your PC’s data content, OS, and anything else you select, and saves it to an external disk. You can schedule regular back-ups to run in the background while you’re using your PC, and it will never tamper with your computer’s performance. But that way, you’ll always have the latest version of your computer’s personality and contents backed up to an external disk just in case. This concludes our list of 7 bad tech habits, though there are plenty more we can think of! What are your bad tech habits? Share on Facebook and Twitter. Laplink Software, Inc. announced today our partnership with Webroot to provide a software bundle to users purchasing a new Windows 10 PC this holiday season. Webroot is the market leader in intelligent cybersecurity for endpoints and collective threat intelligence. In partnership with Laplink, the two companies will boost their consumer offerings by bundling Webroot SecureAnywhere® Internet Security with PCmover Express to make cybersecurity and new PC setup easy—just in time for the holiday shopping season.